A NEW president has been appointed by Lothersdale Young Farmers’ Club. Craven farmer David Airey, who farms 1,000 sheep on upland and heathlands in Sutton-in-Craven, close to the county borders of North Yorkshire, West Yorkshire and Lancashire, has taken up the position after the retirement of Cathie Cromarty. Cathie has held the position of president for many years and will stay on the club’s advisory team. On Saturday 7th July YFYFC hosted Radio 1 DJs Scott Mills and Chris Stark and The Crazy Knights Party Band. Everything went so well, everyone loved the top DJs and The Crazy Knights. The venue at Wetherby was fantastic, easy to get too and a great setting for this type of event. This event is certainly something that can grow for 2019!! A review meeting will be held over the coming my weeks. Members are encouraged to send feedback into the office or contact Ed directly. Yorkshire YFC had a fantastic weekend at the NFYFC Live & Carcase Competition held at the English Winter Fair at Staffordshire Showground. Over all sections and teams, Staffordshire A won, Lancashire B came second and Yorkshire B were came in third. Ben Robinson and Elizabeth Elgie were overall under 18 team winners, with Simon Walton and Daisy Roberts coming 3rd in the overall under 26 team. Evie Harrison-Bradley won Intermediate Pigs overall, with Elizabeth Egie in very close second place. Results are now available for the Live & Carcase Competition held by kind permission of John Penny & Sons yesterday. A big thank you to Gary, all our judges, stewards, helpers and scorers. Well done to all members who competed and qualified to the English Winter Fair on 18/19 Nov. All information will be sent from county office this week. Results available on the Live & Carcase Competitions page. On Friday 22nd September, members from Yorkshire YFC joined BBC Radio York for an interview all things “Young Farmers”. Listen to Harriet Lyon from Rillington YFC and Tom Barley from Great Smeaton YFC chat with BBC presenter Jonathan Cowap. YOUNG farmers from across Yorkshire are supporting a public awareness week to celebrate the organisation’s 85th anniversary. National Young Farmers’ Week, which runs until Friday (22nd), aims to give an insight into the lives of the 23,500 members nationally of the Young Farmers’ Club (YFC). The campaign has received some high-profile support from a wide cross-section of people, ranging from Radio 1 DJ Chris Stark to television presenters Adam Henson and Jimmy Doherty. Yorkshire is one of the largest counties by number of young farmers in the country. It has more than 1,700; with 45 clubs spread over nine districts. There is a national network of 619 clubs, with members aged between ten and 26. YFC has been given a huge boost this year with the appointment of a new president, Farming Today and Countryfile presenter Charlotte Smith. She made a special visit to this year’s Great Yorkshire Show to support the county’s members. “I want the nation to know more about one of our countryside’s best kept secrets,” says Charlotte. “YFC is more than farming – it’s one of the only rural youth services we have that helps develop young people’s skills and provides a much-needed social network in the countryside. Clubs across Yorkshire are just getting back into the swing of their weekly meetings after the traditional harvest break and many are organising special new member evenings. Chairman of Yorkshire YFC John Craddock believes very strongly that as long as somebody has a “rural mindset” then their background is irrelevant. “Young farmers is a true rural organisation and is no longer just for farmers,” said John, who farms at Kirklington, near Masham. Fundraising is also a big part of the YFC movement, with the Yorkshire region’s members raising more than £45,000 for different charities last year. This year’s efforts included a mammoth cycle ride of 360 miles from county headquarters in Knaresborough to Torquay, raising more than £4,500 for the Anthony Nolan charity. For further information about joining YFC visit www.yfyfc.org.uk or telephone the county office on 01423 865870. Fancy a go at Live and Carcase but don’t know what it entails or want to brush up on tips? Join us on Saturday 7th October, by kind permission of J Penny & Sons, for a training session. OPEN TO ALL!! Visit the Live & Carcase Competitions page for more details or Contact County Office to enter. Yorkshire YFC once again showed their strength at Northern Area Stockman 2017 on Saturday 15th July, held at Hexham & Northern Marts. 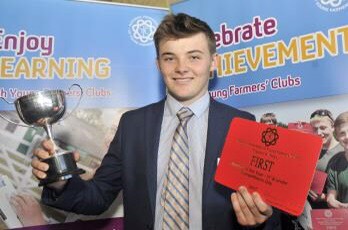 Tom Barley of Great Smeaton YFC, recently awarded NFYFC Member of the Year, triumphed coming home first place in the Junior Stockman, with the Yorkshire B Junior Team winning overall. A mention must be given for Jacob Ryder, Farnley Estate YFC, who scoped 100/100 for the Breeding Ewes coming a clear first place in the class. Other Junior awards were given to Elizabeth Elgie, Boroughbridge YFC, for third place in Dairy. In the Senior competition, Emily Ward, Whitby YFC, came third in Dairy and Chloe Dolphin, Silsden with Skipton YFC, also came third in Butchers Lambs. Across all competitions and classes, Yorkshire B came second, being pipped by Lancashire A. Cumbria A followed in third place. Well done to all Yorkshire YFC members, and good luck with the next round.